Twitter is testing a redesign of its desktop website. If implemented, it would be the first major Twitter web redesign in a long time. We've got screenshots of the test. 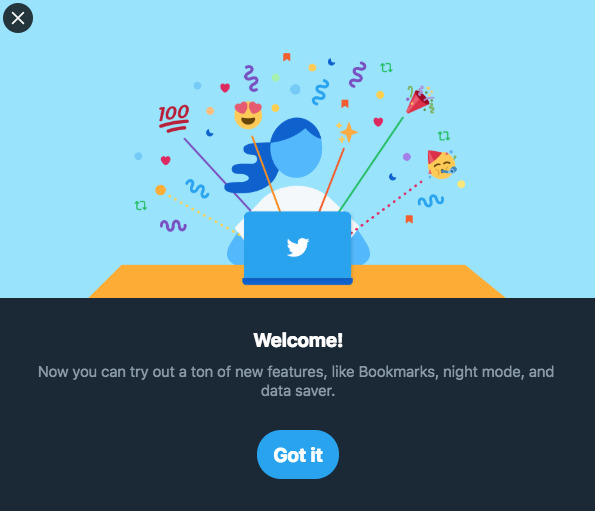 Twitter is testing a redesign of its desktop website that adds a night mode, data-saving mode, bookmarks, and other new features, the company announced on Thursday. The redesign will look very familiar to anyone who's used Twitter on a mobile phone browser or Windows. The experience is nearly identical. "This is a limited test for now," a Twitter spokesperson told Business Insider. It appears that the new desktop website test is a Progressive Web App, a standard that discusses how to build apps in browser windows. One cool feature is that it allows websites to be pinned to a dock or taskbar, just like an app. So if you don't like the new design, at least you can switch back to "legacy Twitter" for now.